The animation giant and its fans applauded the win. But it also resonated powerfully with another audience. Asian communities around the world took to social media to congratulate Ms Shi and express their delight. One Twitter user said in a response to this now-viral tweet that she was happy at the film's recognition and shared that she had "wept in a theatre full of shocked and horrified" non-Asians who also caught the eight-minute movie. One mother from San Francisco, who loved Bao, even tweeted that it spoke to her "loud and clear, through tears". On Facebook, the praise continued. "Bao was something very relevant to me because I am a daughter of a Korean mother and I grew up like this - very sheltered and watched," said one user Janice Bouhaja who watched it with her children and "cried almost during the entire short". Another fan, Hoàng Vỹ Nguyễn from Vietnam, described the clash between "old Oriental social norms and family values" in Bao and added that she was "totally won over". Pixar shorts often generate as much buzz as their feature length offerings and are examined in great detail; they can also prove divisive and controversial. While its themes of motherhood and the symbolism of Asian food as feelings were celebrated by Asian audiences, Bao drew a mixed response from a more general audience. 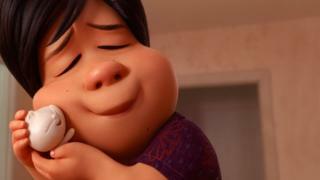 Many of the responses from Asians on social media saw those mixed reviews as a product of western viewers failing to understand the film's concept, failing to get how resonant the notion of a dumpling as a substitute-child actually was. At the time it stirred heated debates online about a "cultural divide" between Asian and Western viewers in a landmark year for Asian representation in film, with the release of Crazy Rich Asians, the first Hollywood film for decades to boast an all-Asian cast. "This wasn't meant for you," was one tweet that went defiantly viral in response to a review that concluded the short was just, well, confusing. At that point, some vocal Asian-Americans saw it as a failure of mainstream culture to recognise or empathise with experiences unique to a minority community - although it has to be said there were non-Asian audiences who also spoke out for the short. Reporting by the BBC's Heather Chen and Eleanor Dunn in Singapore.